(9231, M. R. Tidwell Collection, OHS). As the county seat of Tillman County, Frederick is located at the junction of U.S. Highway 183 and State Highway 5. Two platted townsites, Hazel and Gosnell, preceded Frederick's existence. When the land lottery was held on August 6, 1901, to open the Kiowa-Comanche-Apache Reservation to homesteaders, a man named Stout drew a quarter section, which was a government-platted townsite. He named it for his daughter Hazel. Rev. Sanford N. Gosnell also drew a quarter section, one-half mile north of Stout's, and named it Gosnell. He sold lots, and soon businesses were established. A post office at Gosnell was established on November 5, 1901. Knowing that the Blackwell, Enid and Southwestern (BES) Railroad (later the St. Louis and San Francisco Railway) was planning to build their line through the area, every town wanted a depot. Charles E. Hunter, agent for the BES Townsite Company, made an agreement with the Gosnell townspeople to place the depot there if they would change the town's name to Frederick, after the son of railroad director Jacob C. Van Blarcom. The town offered several lots to the railroad, which immediately built a depot. The post office name was officially changed from Gosnell to Frederick on September 30, 1902. Disappointed Hazelites decided to work with Frederick citizens to make the area prosperous. Hazel businesses relocated, including a newspaper, the Hazel Enterprise. Other early newspapers included the Frederick Free Press, the Frederick Enterprise, and the Frederick Leader. Hazel's school building was moved to East Grand and Twelfth Street in Frederick, and five rooms were added. This building was used until circa 1906, and when a new brick building for the high school was built at this site, the frame building was moved to the west side of town. Soon two other brick school buildings were built. Sponsored by the Mothers' Culture Club, the first kindergarten opened in 1906. Students furthered their education at an early-day business college and a junior college. The Frederick Public Library, funded by the Carnegie Corporation and built in 1915, continued in operation at the turn of the twenty-first century. In April 1905 Pres. Theodore Roosevelt selected this area for a vacation that included a wolf hunt conducted by "Catch-'em-Alive" Jack Abernathy. Roosevelt promised then to make Oklahoma and Indian territories into a state, and Tillman County (named for a South Carolina senator) was organized at 1907 statehood. The Tillman County Courthouse, erected in 1920, is listed in the National Register of Historic Places (NR 84003455). The U.S. Census recorded a Frederick population of 3,027 in 1910. It grew to 3,822 in 1920 and to 4,586 in 1930. 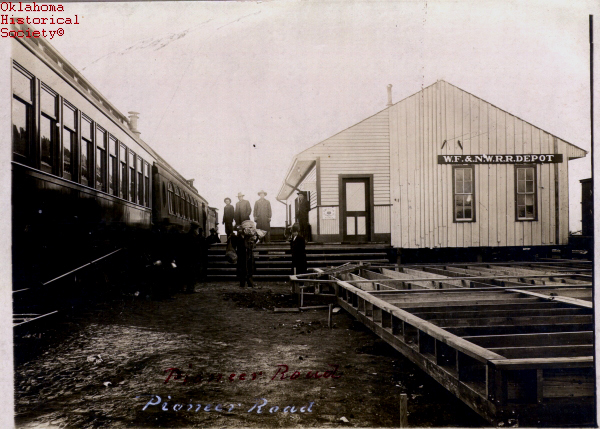 Three daily passenger trains brought groceries, lumber, and supplies to the bustling agricultural area. Numerous cotton gins, grain elevators, factories, and hotels were in full operation by 1918. In 1901 a telephone exchange was established, in 1905 electricity was furnished by a dynamo at the gin, and in 1919 natural gas was available. Fires in 1904 and 1905 destroyed most of the businesses, which were replaced by two-story, brick buildings. A brick city hall was built in 1910, and a fire department was organized in 1907. Two doctors opened the first hospital, over a bank, in 1914. The water wells dug in 1913 have been replaced by water supplied from Lake Frederick, which also furnishes camping, boating, and recreation. The Frederick Army Air Field opened in 1941 for final training of cadets on UC-78s (trainer/light transport aircrafts) and B-25s (medium bombers). The field developed into Frederick Industrial Park, and the runways continued in use at the turn of the twenty-first century. By 1950 Frederick had 5,467 inhabitants. Frederick's population peaked at 6,153 in 1980 and dropped to 5,221 in 1990. At the turn of the twenty-first century, with 4,637 citizens the town had a city manager–council mayor form of government. The citizens supported had twenty-four active churches. Local farmers continued to raise wheat, cotton, and cattle, and three dairies operated. The 2010 census counted 3,940 people living in Frederick. Local attractions have included a restored 1930 hotel, the Ramona Theater (NR 84000377), and an antique mall. The Tillman County Historical Museum (Pioneer Heritage Townsite Center) has featured a railroad depot, a one-room school, a 1920s AME church, and other buildings and items used by early pioneers. An annual Oklahoma Cotton Festival has been regularly held each September. A Diamond Jubilee History of Tillman County, Vol. 2 (Frederick, Okla.: Tillman County Historical Society, 1978). "Frederick," Vertical File, Research Division, Oklahoma Historical Society, Oklahoma City. Wanda Jo Evaige, "Frederick," The Encyclopedia of Oklahoma History and Culture, https://www.okhistory.org/publications/enc/entry.php?entry=FR011.